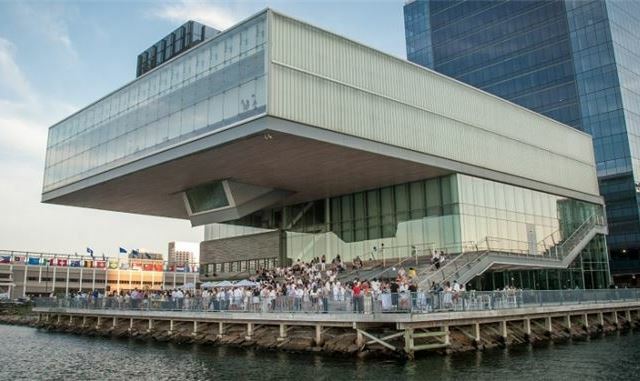 •	ICA (25 Harbor Shore Dr., Boston, icaboston.org): Boston’s Institute of Contemporary Art is celebrating First Fridays right out the gate on September 1. Drop by for live music, harborside games at its architecturally iconic space, craft cocktails, DJ beats, and a sunset dance party – there’s no better place to do a jig than among the creative set! •	Harbor Sail: Head down to the Moakley Courthouse at the other side of the neighborhood this weekend to take the city’s only historic tall ship out to sea! The World Ocean School will open the 137’ Roseway to the public September 2 at 1PM and September 4 at 4PM. Raise the sails, explore below decks, and even take the helm. Tickets include a drink coupon, and you’re able to bring your own snacks aboard. Reservations are required and can be made at www.worldoceanschool.org. •	Seaport Sweat: Craft your beach body, fall body – whatever body you want! – by the harbor. Seaport Sweat brings local fitness classes to Seaport Common, located next to the ICA at 85 Northern Ave. Classes are Mondays/Wednesdays at 6PM and 7PM, Tuesdays/Thursdays at 5:30PM and 6:30PM, and Fridays features yoga at noon. Other classes range from boxing to “Kick It” to HIIT. •	Harpoon Brewery and Beer Hall (306 Northern Ave., harpoonbrewery.com): Now that you’ve preemptively worked off lunch and libations, head to Boston’s other beer brand and our neighborhood favorite! Harpoon Brewery is open for tours Sun.-Wed. 11AM-7PM and Thurs.-Sat. 11AM-11PM. Be sure to drop by the beer hall for delicious pints and pretzels. The outdoor Harpoon Keg Yard is open on nicer days for al fresco IPAs and other Harpoon offerings!